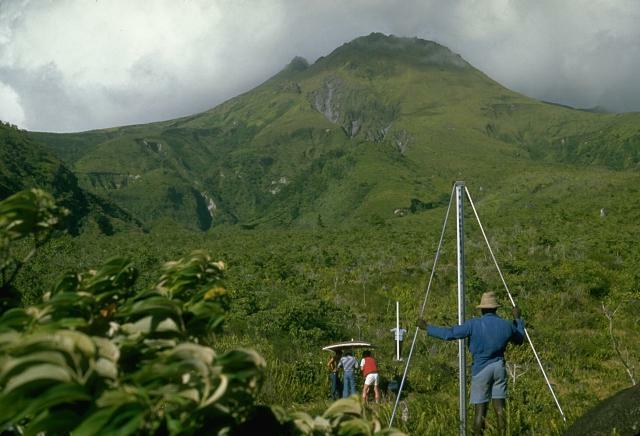 Seismicity began on 11 December 1985, the first recorded since a well-implemented volcano monitoring network was installed in 1978. A constant low level of seismicity has been observed since December, totalling 30 events as of 4 June. Two 3-component stations were established for a month, helping to locate the shocks, at a constant depth of 1-1.5 km below the 1929 crater. Magnitudes were weak, all <2, and only a few were recorded at the Morne des Cadets observatory, 9 km SW of the epicentral area. 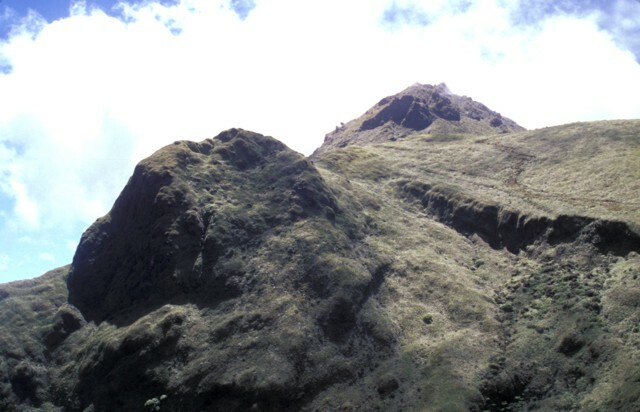 The seismic network is composed of five seismometers within 5 km of the summit. Seismic signals noted before the recent activity were attributed to surface phenomena such as rockfalls or local landslides. Information Contacts: N. Girardin and A. Hirn, IPGP, France; G. Boudon and J.P. Viode, Observatoire Volcanologique de la Montagne Pelée, Martinique. The Global Volcanism Program has no Weekly Reports available for Pelée. 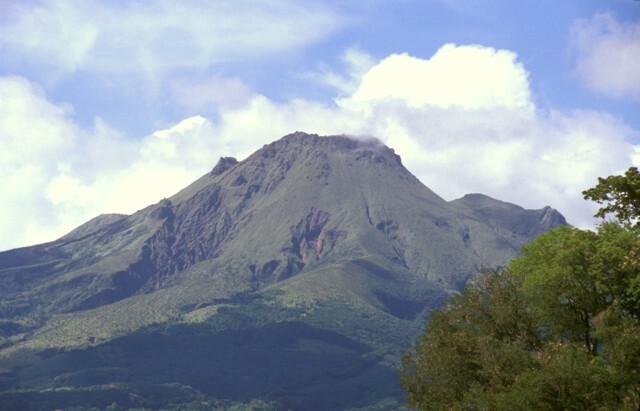 Renowned Montagne Pelée, forming the northern end of the island of Martinique, is the most active volcano of the Lesser Antilles arc. Three major edifice failures since the late Pleistocene, the last about 9000 years ago, have left large horseshoe-shaped calderas breached to the SW inside which the modern volcano has been constructed. More than 20 major eruptions have occurred here during the past 5000 years. Extensive pyroclastic-flow deposits, incised by steep-walled ravines, mantle the slopes of the volcano. The l'Etang Sec summit crater is filled by two lava domes emplaced during the 1902 and 1929 eruptions. Historical eruptions date back to the 18th century; only two modest phreatic or phreatomagmatic eruptions took place prior to 1902. 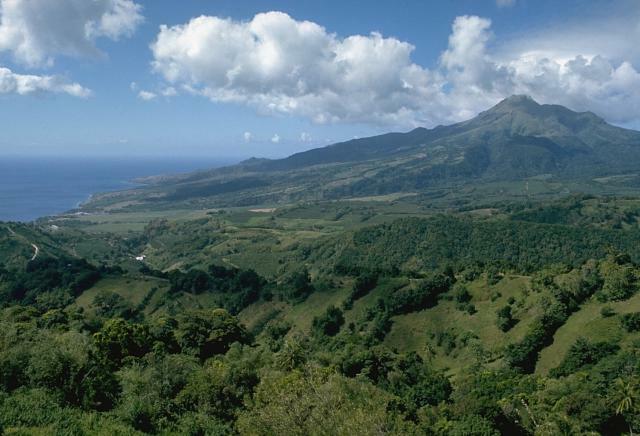 The catastrophic 1902 eruption, which destroyed the city of St. Pierre, the "Pearl of the Lesser Antilles," became the type-example of pelean eruptions and marked the onset of modern volcanological studies of the behavior of pyroclastic flows. There is no Deformation History data available for Pelée. There is no Emissions History data available for Pelée. 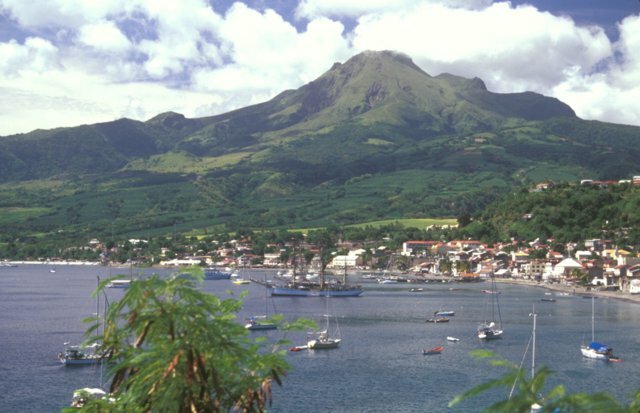 Mount Pelée towers above the city of St. Pierre (on the coast at the left), which the volcano destroyed during a catastrophic eruption in 1902. Pelée is the most active volcano of the Lesser Antilles arc, with more than 20 major eruptions during the past 5000 years. The modern volcano was constructed on the rim of a large SW-facing horseshoe-shaped caldera whose northern wall is the ridge in the shadow on the left horizon. 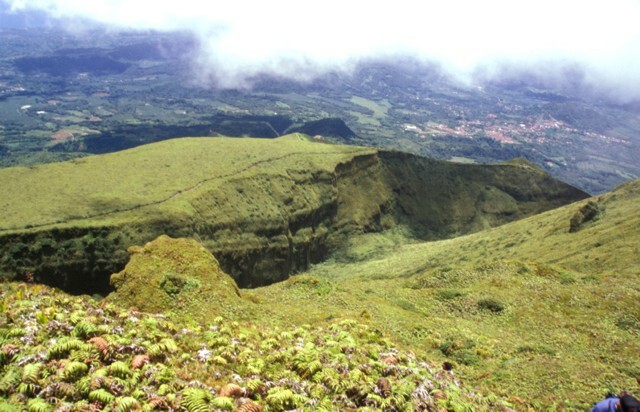 This caldera formed as a result of slope failure of the paleo-Pelée volcano. 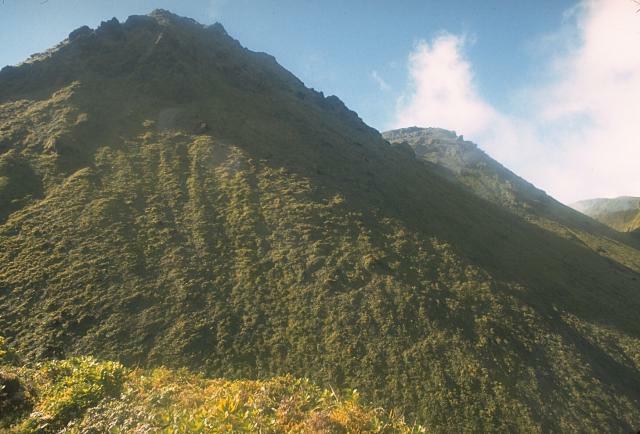 The summit of Pelée volcano rises immediately above scientists from the Mount Pelée volcano observatory and the Smithsonian Institution who are taking precision leveling measurements on the west flank. This procedure, sometimes referred to as "dry tilt," detects deformation of the volcano that often precedes an eruption by measuring the precise differences in elevation between two stadia rods placed on fixed points. This technique is part of monitoring efforts by the observatory to help detect future eruptions of this scenic, but deadly volcano. This photo portrays an unusual combination of geology and history. The light-colored deposits in this outcrop south of St. Pierre are pyroclastic-flow deposits similar to those of eruptions that destroyed the city in 1902. 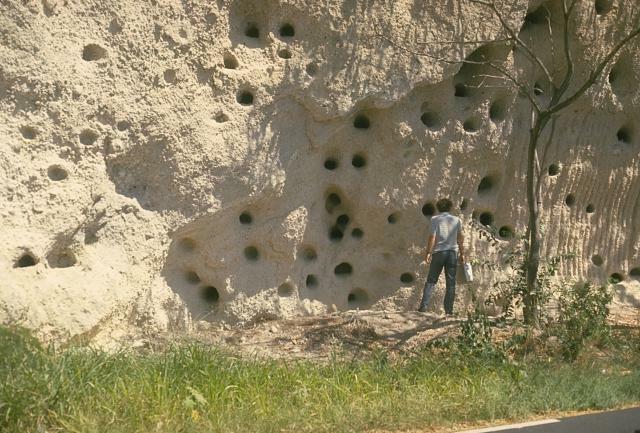 The abundant large holes in the outcrop are not a volcanological phenomenon, but were produced by cannon balls blasted into the unconsolidated deposit during British-French wars for control of the island of Martinique. 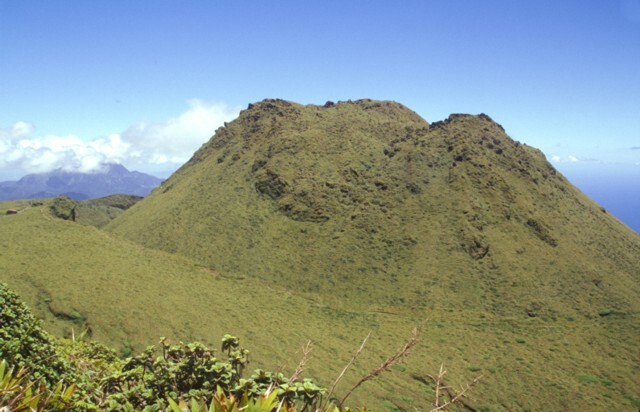 Two lava domes fill much of the Caldiera de l'Etang Sec crater at the summit of Mount Pelee. The lava dome at the left, seen from the east rim of the crater, was formed during an eruption that began in 1929. The vegetated knob halfway down the right skyline is a lava dome from the 1902 eruption. The 1929 eruption was similiar to that of 1902, but smaller in scale. After explosive removal of part of the 1902 dome, growth of a new dome began in January 1930. Pyroclastic flows accompanied dome growth until the end of 1932. Photo by William Melson, 1973 (Smithsonian Institution). 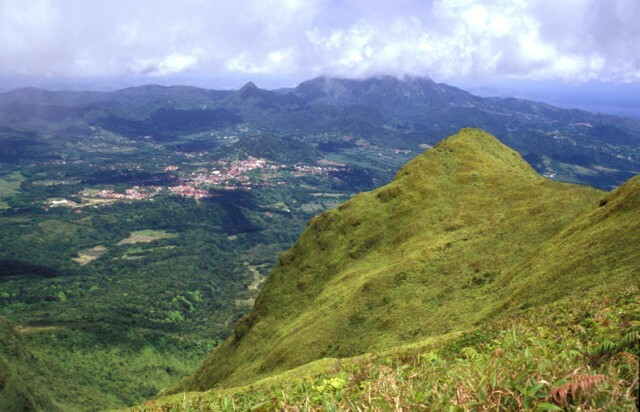 Mount Pelée towers above the city of St. Pierre in northern Martinique a century after the catastrophic eruption that destroyed the city in 1902. Pelée is the most active volcano of the Lesser Antilles arc, with more than 20 major eruptions during the past 5000 years. Lava domes formed during the 1902 eruption and one in 1929 form the present summit, which was constructed within a large scarp visible on the lower left horizon that formed when the volcano collapsed about 9000 years ago. 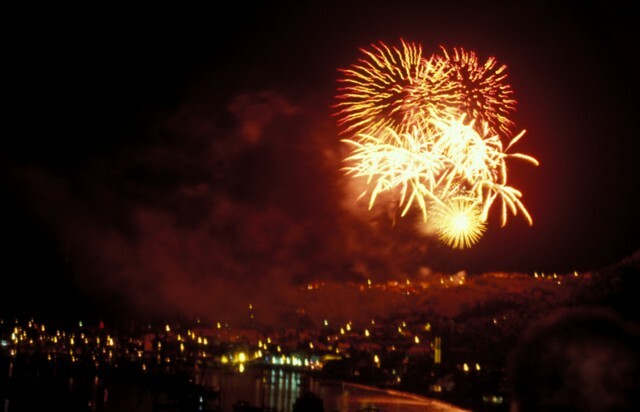 Fireworks rise above the harbor and city of St. Pierre on May 8, 2002, marking the 100th anniversary of the catastrophic 1902 eruption. Thousands of lanterns were also placed in the harbor to commemorate the 28,000 victims of the Montagne Pelée eruption. This prison cell in the city of St. Pierre housed one of the only two survivors of the 8 May 1902, eruption of Mount Pelée. Devastating pyroclastic flows and surges swept down the SW flank of the volcano early in the morning and destroyed the city, killing 28,000 people in the world's deadliest eruption of the 20th century. This view looks west from the 1902 lava dome within the summit crater of Mount Pelée. The area beyond the grassy knoll was part of the first portion of the ancestral volcano that underwent massive edifice collapse more than 100,000 years ago. This massive collapse produced a 25 cu km debris avalanche that swept into the Caribbean Sea up to 70 km from the coastline. 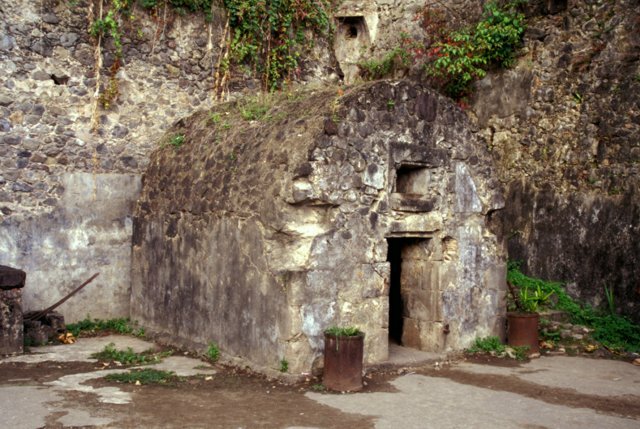 Mount Pelée was subject to three major episodes of edifice collapse--the second took place about 25,000 years and the third about 9000 years ago. The steep-sided grassy knob in the right foreground is part of the Aileron lava dome, which formed during an eruption about 9700 years ago. This view looks to the SE towards the town of Morne Rouge (left-center), which was devastated by pyroclastic flows during the 1902 eruption. 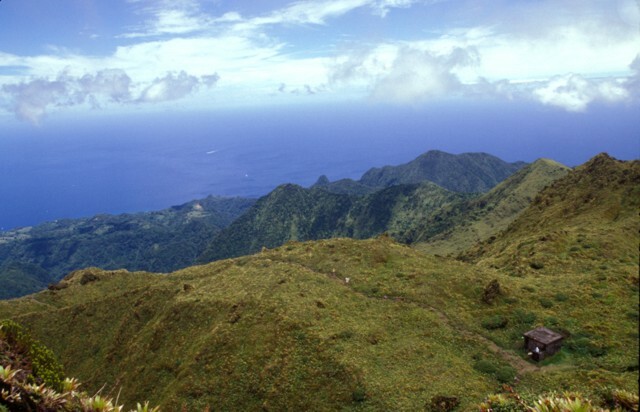 The Pleistocene Piton du Carbet volcano lies in the clouds on the right-center horizon. The steep-sided lava dome at the left is Aileron, which was formed about 9700 years ago. The back side of the dome was cut by the latest of three major edifice-collapse events at Mount Pelée. The eastern rim of l'Etang Sec, the current summit crater, cuts horizontally across the photo at the upper right in front of the 1929 dome on the right horizon. This view from the summit of Mount Pelée shows the eastern rim of l'Etang Sec, the current summit crater of Mount Pelée. The 1902 and 1920 lava domes fill much of this crater. The town with reddish roofs at the far right is Morne Rouge, affected by pyroclastic flows from the 1902 eruption. The 1929 lava dome forms the summit of Mount Pelée in this telephoto view from St. Pierre. The modern volcano was constructed within a scarp produced by collapse of the volcano about 9000 years ago. The irregularity on the right-hand flank is part of the eastern summit crater rim and the Aileron lava dome, which erupted about 9700 years ago. Photo by Paul Kimberly, 2002(Smithsonian Institution). The 1902 lava dome fills much of the l'Etang Sec summit crater, as seen here from Morne Macouba, north of the summit. Following the catastrophic eruption on May 8, 1902, rapid growth of a summit lava dome began; it reached 350 m height by July 6. Intermittent explosive activity continued until October 31, 1903 and lava dome growth continued on a diminishing scale until October 5, 1905. The famous spine at one point rose to 1617 m, 220 m above the current summit (the 1929 lava dome), before it crumbled away. The Global Volcanism Program has no maps available for Pelée. Large Eruptions of Pelée Information about large Quaternary eruptions (VEI >= 4) is cataloged in the Large Magnitude Explosive Volcanic Eruptions (LaMEVE) database of the Volcano Global Risk Identification and Analysis Project (VOGRIPA).